Mayor Michael A. Nutter announced that he will lead a trade mission to the United Kingdom and Israel next month in order to attract investment from international companies in Philadelphia and to assist Philadelphia companies with trade opportunities in these two key marketplaces. Mayor Nutter will be joined by a number of Philadelphia-area companies on both legs of the mission and will take part in a range of activities to promote Philadelphia and attract international investment. In the United Kingdom, Mayor Nutter and Deputy Mayor for Economic Development Alan Greenberger will meet with more than 100 UK companies interested in doing business in the Philadelphia region at a reception hosted by UK Minister for Trade and Investment Lord Green. They will participate in roundtable discussions with industry leaders in energy efficient building and infrastructure investment and will visit Tech City to share best practices on how cities support the growth of startups and entrepreneurs. Mayor Nutter will also attend the World Travel Market, one of the largest tourism and travel expositions in the world. With the Mayor will be Jack Ferguson, CEO of the Philadelphia Convention and Visitors Bureau (PHLCVB), and members of his team to meet with tour operators, trade and consumer media, and airline executives to promote Philadelphia. 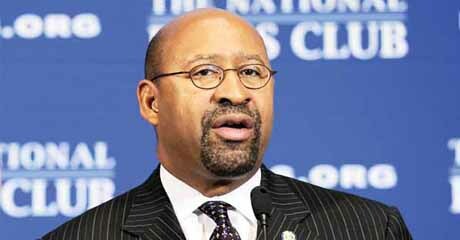 Mayor Nutter will also have a number of one-to-one meetings with business executives on specific initiatives in Philadelphia and will meet with a range of high-level political leaders. While in Israel, Mayor Nutter will be hosted by the City of Tel Aviv, a sister city of Philadelphia since 1996, and will participate in a range of activities to highlight the importance of this relationship. He will meet with Israeli companies looking to invest in North America, including a range of Israeli venture capitalists looking for investments and American cities that are suitable for portfolio companies looking to expand into the United States. Accompanied by a number of Philadelphia leaders, Mayor Nutter will attend the Jewish Federations of North America General Assembly in Jerusalem and visit key historic and cultural sites of importance to the Jewish community. Finally, Mayor Nutter will be joined by Drexel President John Fry and Dr. Steven Altschuler, CEO of the Children’s Hospital of Philadelphia, as they announce an exciting new research partnership with Hebrew University in Jerusalem. Joining Mayor Nutter on the trade mission will be a range of Philadelphia companies from sectors including technology, clean energy, green building, manufacturing, venture capital, and biotech that are pursuing specific trade objectives in either the United Kingdom or Israel. They will be provided with a tailored program ,including meetings with business leaders and potential customers, in-country briefings, and connections with industry experts. A full list of businesses will be published closer to the departure date but companies signed up to participate include Aberdeen Asset Management, the Mark Group, Artisan Mobile, and Derbyshire Machinery and Tool Co. This trade mission was made possible by the support of a number of partners including the Commonwealth of Pennsylvania, UK Trade and Investment, the Consulate-General of Israel, Select Greater Philadelphia, the International Visitors Council, the World Trade Center of Greater Philadelphia, Drexel University, Children’s Hospital of Philadelphia, the Jewish Federation of Greater Philadelphia, the Philadelphia-Israel Chamber of Commerce, US Airways, British Airways, the United States Commercial Service, PHLCVB, Philadelphia International Airport, The Mark Group, Aberdeen Asset Management, London and Partners, the British American Business Council, the Honorary British Consul, and Greenberg Traurig. All businesses and organizations will cover their own travel and accommodation costs. Costs for City of Philadelphia officials will be covered by Select Greater Philadelphia. The trade mission will arrive in London on November 2, 2013, departing for Tel Aviv on November 6, 2013, arriving back in Philadelphia November 12, 2013. A full itinerary will be published closer to the departure date.